Squandermania and other foibles: Not THAT Lowell, the other one! Not THAT Lowell, the other one! Ron Silliman recently showed that "quietism" has its roots in the methodology of Jones Very, Sidney Lanier, and... James Russell Lowell. But ironically, the term "School of Quietude" comes from Edgar Allan Poe (Happy Belated Birthday, Edgar!) - and Poe adored James Russell Lowell, as you can see from a review essay in which he says that Lowell "has given evidence of at least as high poetical genius as any man in America." Me, I'm not too crazy about J.R.'s stuff, but I'm no Poe, that's for sure! This new volume of poems by Mr. Lowell will place him, in the estimation of all whose opinion he will be likely to value, at the very head of the poets of America. For our own part, we have not the slightest hesitation in saying, that we regard the "Legend of Brittany" as by far the finest poetical work, of equal length, which the country has produced. We have only to regret, just now, that the late period at which we received the volume, and the great length to which Mr. Poe has been seduced into a notice of "Orion," will preclude an extended notice and analysis this month of Mr. Lowell's volume. This, however, we propose at some future period. For the present, we must content ourselves, perforce, with some very cursory and unconnected comments. Mr. Lowell is, in some measure, infected with the poetical conventionalities of the day -- those upon which Mr. Poe has descanted in speaking of Mr. Horne's epic. He has suffered himself to be coteried into conceptions of the aims of the muse, which his reason either now disapproves, or will disapprove hereafter, and which his keen instinct of the beautiful and proper has, long ere this, struggled to disavow. It will not be many days before he dismisses these heresies altogether; and, in his last, longest, and best work, we clearly see that he is already growing wearied with them -- although the distaste may yet be scarcely perceptible to himself. We mean to say that he will soon find it wise to give every thing its due time and place. He will never the less reverence the truth nor ever will the welfare of his race be less precious in his eyes than now -- we should grieve, indeed, could we think it would -- but his views of the modes in which these objects are to be advanced will undergo modification, and he will see distinctly, what he now but vaguely feels -- that the sole legitimate object of the true poem is the creation of beauty. The "Legend of Brittany" includes a hundred and eighteen of the Don Juan stanzas. Its subject is exquisitely beautiful. Whether it is original with Mr. Lowell we know not -- most probably it is not -- but the story itself (from whatever source derived) forms one of the truest and purest poetical theses imaginable. A Templar loves and betrays a maiden. Afterward, to conceal his guilt, he murders her, enceinte, concealing the corpse, temporarily, behind the altar of his church. A nameless awe prevents him from removing it. Meantime, a festival is held in the church; and, during the swell of the organ, the spirit-voice of the deceased addresses itself to the murderer. It represents that she, the murdered, cannot enjoy the heaven which she inhabits, through grief at the destiny of the unbaptized infant in her womb. She implores its baptism. The poem ends with the performance of this rite, and the death, through remorse, of the repentant lover. Think not in death my love could ever cease. Our unbaptized babe shut out from bliss. Save for my curse of immortality. Of wings that roughen wide the pitchy deep. Forever in that silence drear and dim. The rite that gives him peace in Christ's dear name. That Heaven and Earth are both alike in wo. The description of the swelling of the organ -- immediately preceding these extracts -- surpasses, in all the loftier merits, any similar passage we have seen. It is truly magnificent. For those who have the book, we instance the forty-first stanza of the second book, and the nine stanzas succeeding. We know not where to look, in all American poetry, for any thing more richly ideal, or more forcibly conveyed. The music is suddenly interrupted by the nameless awe which indicates the presence of the unseen spirit. A hideous shape of dread were standing there. The defects observable in the "Legend of Brittany" are, chiefly, consequent upon the error of didacticism. After every few words of narration, comes a page of morality. Not that the morality, here -- not that the reflections deduced from the incidents, are peculiarly exceptionable, but that they are too obviously, intrusively, and artificially introduced. The story might have been rendered more unique, and altogether more in consonance with the true poetic sentiment, by suffering the morality to be suggested; as it is, for example, in the "Old Curiosity Shop," of Dickens -- or in that superb poem, the "Undine" of De la Motte Fouqué. Earth's dust hath clotted round the soul's fresh wing. Here the harsh consonants are excessive. But we feel ashamed of alluding to trifles such as these in the presence of beauties so numerous and so true. We extract, at random, a few of the smaller gems of the poem. A golden edge from some unsetting sun. A lily chance-sown in the rugged wild. Seemed a more visible gift of spring than she. Wakes all the green strings of the forest lyre. Its warm, voluptuous breast doth all unclose. As if a star had burst within his brain. Forever, ever, falling far away. Left round her heart the halo of his smile. To wreck their freight of sunshine on the strand. As in a living sepulchre, his soul. While we were gazing, life and motion took. We have left ourselves no room to speak of the other poems in detail. Those which we think best, are "The Moon," "To Perdita Singing," "Midnight," "Rosalie," "Reverie," "The Shepherd of King Admetus," and "A Dirge." These are crowded with excellences of the loftiest order. "Prometheus" we have not yet read so attentively as we could wish. Altogether, we intend this as merely an introduction to an extended review of all the poems of Mr. Lowell. In the mean time we repeat, that he has given evidence of at least as high poetical genius as any man in America -- if not a loftier genius than any. Source: Graham's Magazine, March 1844, pp. 142-143. 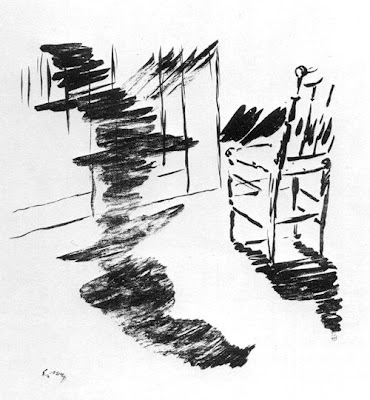 Illustration above by Manet for "The Raven," in particular the lines: "And the lamplight o'er him streaming throws his shadow on the floor; /And my soul from out that shadow that lies floating on the floor / Shall be lifted— nevermore!" Addendum: The story behind the story of "quietude" can be found here, thanks to Shanna Compton, who brought it to my attention. Quite the flowery critic, our Edgar! I know Silliman asserts that Poe came up with the term in the 1840s, but I do wonder where and given what contingent points of reference. And I wonder how much ormulu Poe criticism I'd have to read through to find out...I am on my way to the library, but tackling Lowell the younger is my aim. Given that I'm actually trying to read poetry and learn about it this semester, I've disengaged from the electronic fray, especially given that I'm a thread-killer and was somehow always on a different page (or even in a different library) from everyone else. But I lurk here with Byronic glee. "Confess—confess—you dog—and be candid—that it is the sublime of that there sort of writing." Oh and PS—my final prelurking blurt, for what it's worth; which is to say, it and five bucks might get you a latté. Rob, Poe's middle name was misspelt twice, an egregious error now corrected - for which apologies and thanks. The spellings in his essay are as they were in the original, and I have not attempted to alter them.